The Delineator is a derivation of the McClellan Oscillator. It uses market breadth, not price, to measure and forecast future price direction. But more than a simplistic buy/sell indicator, the Delineator is a process of analysis and decision making that is measurable and repeatable. I designed the Delineator in 1998 when I was a portfolio manager and used it to manage over $250 million in growth investments. Maintaining a disciplined approach to the timing of investment decisions is critical to long term success. This is the key benefit of using the Delineator. The tutorial video fully describes the Delineator and how it is used. The Delineator provides a multiple time period framework from which to view market trends. The daily chart, called the Secondary shown above, determines the main trend. The 30 minute chart, called the Primary shown below, is used to identify subcycles within the main trend and is the trigger for timing purposes. The Primary will only confirm trends that are supported by the direction of the Secondary. If the Secondary is up, only up cycles on the Primary will be confirmed. If the Secondary is down, only down cycles will be confirmed by the Primary. It is this pairing of time frames that makes the Delineator reliable for the ETF investor who wants to hold a position over a period of time, and it can be used quite effectively for day trading as well using the 30m/5m time pair. The Delineator is particularly good at identifying reversals as they set up. A WORD OF CAUTION: The Delineator IS NOT a mechanical trading system. You DO NOT go long when it turns green and then sell and go short when it turns red. Trades are put on as the Primary changes slope and a targets are always used. This page does not explain how to trade, it explains the process and terminology only. You learn how to trade it following the daily posts in the Journal. So let's describe the components of the Delineator using the 30m Primary shown below. The Delineator is the line with the multi-colored dots. The green indicates an uptrend Delineator cycle and the red indicates a down trend Delineator cycle, the gray indicates an unconfirmed signal. The white arrows are slope changes not buy or sell signals. The orange line is the change of the Slope value (and is the most important item to understand.) The blue lines are of course the time series of the ETF, SPY in this case. The Primary and the Change (orange) lines are independently displayed so do not look for cross overs as there are none. The Primary oscillates between positive and negative extremes based upon changes in market breadth, what is called signal weight. Increasing signal weight makes the Delineator rise, negative signal weight makes it fall. The Primary cycles between values of approximately -8000 to +8000. Integrated into the Delineator are the tools needed to monitor these values and use them to predict when a slope change will occur. When a slope change confirms, price will soon follow in that direction. Once the Primary changes slope, it cannot change slope again until it completes its cycle. Consider each cycle on the Primary as comprised of an initial phase, and a terminating phase. The initial phase begins at the slope change signal and ends when the Slope value is at maximum--the Change shows zero. This is the easy money phase of the cycle. During the initial phase, any counter trend move in price will resolve back in the direction of the Delineator. During an up cycle, you should be buying every dip back near the low of any previous bar. You have virtually no chance of the trend suddenly reversing. Selling out of a long position during the initial phase should only come as a result of hitting a profit target. If you get spooked and want to sell out of a long because you are afraid the trend is going against you, you need to do some pushups or buy those lows and stop worrying about being wrong. During the terminating phase, the final push in price exhausts as the Slope value moves back toward zero pulling price with it in the opposite direction. At maximum terminus, the Primary is overextended at a high level of signal weight and the Slope already moving backward, a balloon underwater. One thing: the initial phase is shorter in time than the terminating phase, which can be more than 50% of the entire cycle. As signal weight changes, it either adds to or subtracts from the Slope value which is reflected in the Change component. In this way we can predict from any level in signal weight how long the Slope can rise before it reaches its maximum level for that level of signal weight. The Primary's value is determined by the Slope value. The value of the Primary is +4450 and the Slope is +665. We can easily determine the value of the Primary during the next 30 minute bar will be +5115 (the slope value added to the Primary). Further, we can see that the Change value is -8. The Change is the change in value of the Slope from one bar to the next. So with the Change being -8, we know that the Slope value has already reached its maximum given the current level of signal weight. This means that further increases in price are unlikely to sustain unless signal weight increases from its current level of +1480. We also know that the current cycle is old. Further, we can predict how long it will be before the Primary becomes overextended in the +8000 value range. At +4450, the Delineator is 3550 ticks away from +8000. Dividing the Slope into this value gives us 5.3 bars (3550/665) or about 2.5 hours of trading. We want to time our entries into cycles as they originate and our exit as they become overextended and unsustainable. So in this example, profit taking would be the trading focus. We certainly wouldn't want to be establishing new long positions this late into a Delineator cycle, nor would we wait for a slope change down to exit. Price could still very well rise but from the perspective of the discipline, profit taking not establishing new long positions is indicated. Again using this example, we can determine what would need to happen to begin the process of the next slope change. First, signal weight will need to become much less positive. If signal weight during the next bar dropped to zero from +1480, the Slope value would change by approximately -150 ticks. (We would know this if it happened because the amount would be calculated by the program). Dividing -150 into the Slope of +665 we get 4.4 or about 2.5 hours. 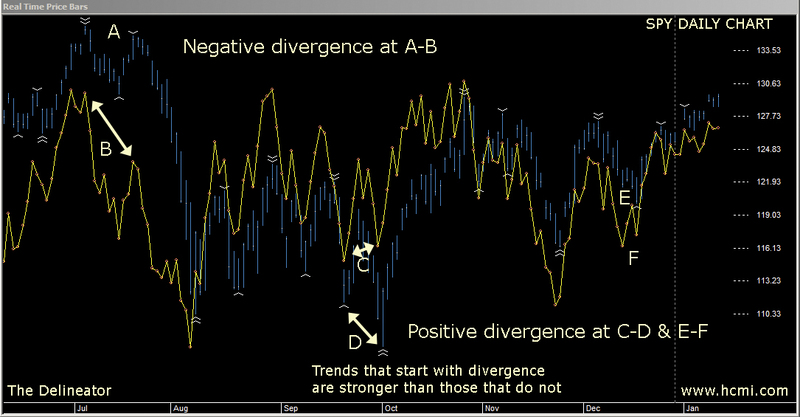 Negative divergence, shown above at points A & B is when price makes higher highs, but the Delineator makes lower highs. This tells us that the trend is going to reverse and to sell into the highs. Positive divergence, points C & D, and E & F is where price makes a lower low but the Delineator makes a higher low. This tells us to buy into the lows. WHEN CYCLES ON THE SECONDARY BEGIN WITH DIVERGENCE, THAT NEW CYCLE WILL BE STRONGER THAN THOSE THAT DO NOT START WITH DIVERGENCE. This is very important and I have seen this play out on the Delineator consistently since 1998. I am the first to point out that the Delineator has a steep learning curve. Many have learned to follow price, using price based indicators, then make decisions based upon how price is moving or in reaction to it. You will see that price follows the Delineator, so when the Primary changes slope up, price will soon reverse and move higher. Trading and investment decisions are based upon the motion of the Delineator not upon price action. After 14 years of using it I can tell you that the Delineator is a reliable leading indicator of price. I invite you to follow the Delineator by signing up for the Delineator Journal website. The Journal is there to support existing users and allow new users to follow along and see what we're doing.